A countdown site launched a few days ago for a new game by Bandai Namco and CyberConnect2. The game was to be for mobile devices. 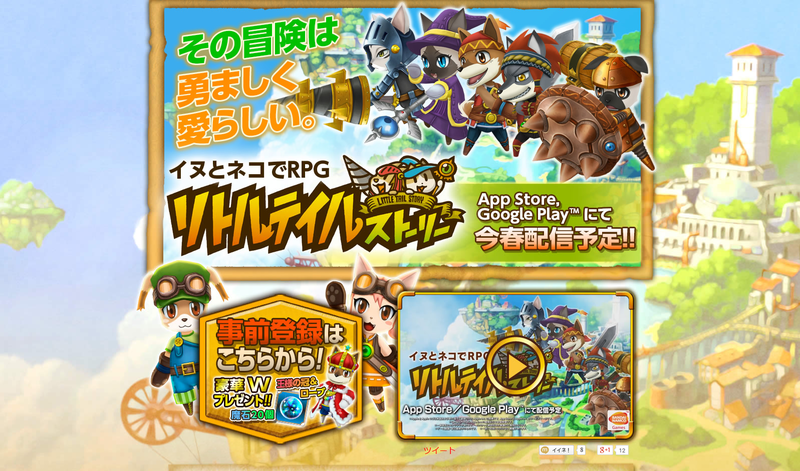 I speculated that it may have been the next in the Little Tail Bronx series, and therefore the sequel to Solatorobo that was announced over a year ago. As it turned out, I was right. Dog and Cat in an RPG: Little Tail Story is CyberConnect2’s next game, announced alongside a trailer which is embedded below. It’s set in a world filled with cats and dogs and is being marketed as a game that anyone can pick up and play. The characters are all 3D models. The “active command battle” system sees you rotate your party members in order to fill up a “cyclone gauge”. When this gauge is filled, you can pull off a “cyclone attack”, which hits your opponent’s weak spots. The attacks change constantly in boss battles, meaning you need to be aware of everything that’s going on as you play. Clearing earns you treasure, which can then be used to buy, create and upgrade equipment. All upgrades made to a weapon will be visible. Multiple classes are available. Swordsmen use swords, knights use lances, guards use shields, fighters use axes and wizards use staves. Classes can be changed on the fly, allowing you to gain certain skill sets. Little Tail Story will release in Japan this Spring for iOS and Android devices. Those with Japanese mobiles can pre-register their interest in the game here. Doing so will earn you 20 magic stones for free, which are otherwise paid for. It will also net you a couple of rare items known as the King’s Cap and the King’s Robe. Thanks for the translation, Will!